Price Reduction. Motivated Sellers. 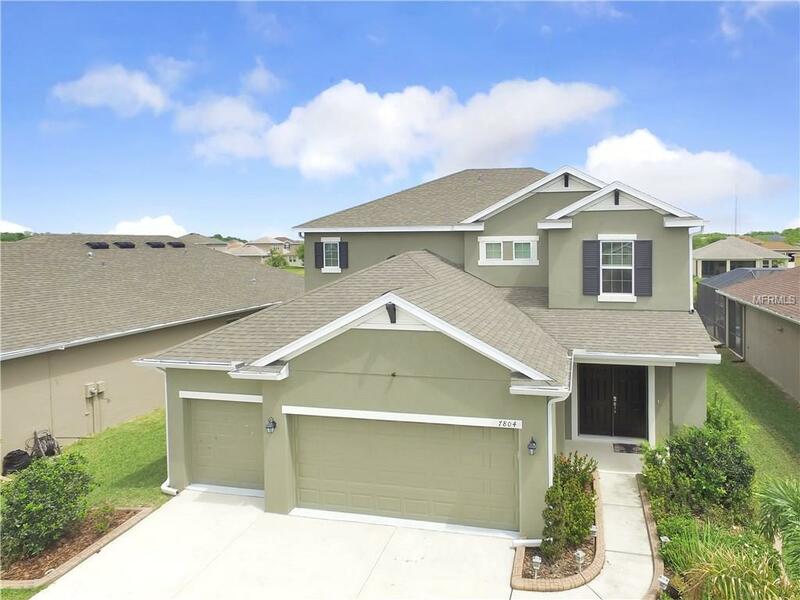 AMAZING POND VIEW IN THIS GREAT FOUR BEDROOM, ENERGY STAR QUALIFIED, "CELEBRATION" FLOOR PLAN IS IN A GATED COMMUNITY. FAMILY ROOM IS OPEN TO THE KITCHEN & NOOK, WHICH HAS SLIDING GLASS DOORS OPENING ONTO A COVERED (20'X10') LANAI. THE KITCHEN FEATURES 42" MAPLE EXPRESSO CABINETS WITH 2" CROWN MOULDING, STAGGERED OVER THE MICROWAVE, STAINLESS APPLIANCES, CENTER ISLAND, GRANITE COUNTERTOPS WITH UNDERMOUNT STAINLESS SINK, BACKSPLASH, & UPGRADED KITCHEN FAUCET. OFF THE ENTRY FOYER IS THE FORMAL LIVING & DINING ROOM. COMPLETING THE FIRST FLOOR IS A FULL BATH WITH GRANITE COUNTERTOP & A DEN WITH DOUBLE FRENCH DOORS. UPSTAIRS, MASTER BEDROOM FEATURES TRAY CEILING, WALK-IN CLOSET, & A DELUXE MASTER BATH WITH GRANITE COUNTERTOP, DOUBLE UNDERMOUNT SINKS, DESIGNER TILE LISTELLO FOR SHOWER, BRUSHED NICKEL SHOWER ENCLOSURE, & UPGRADED WALL TILE. BEDROOMS TWO & THREE SHARE A HALL BATH WITH GRANITE COUNTERTOP. COMPLETING THE SECOND FLOOR IS A UTILITY ROOM & A SPACIOUS (14'X16') GAMEROOM FOR GREAT ENTERTAINMENT! THERE IS UPGRADED CARPET & TILE THROUGHOUT THE HOME. OTHER EXTRAS INCLUDE ADDITIONAL RECESS LIGHTING IN THE FAMILY ROOM, TWO PENDANT PRE-WIRES OVER THE ISLAND, EXTRA FAN PREWIRES, 12" XENON UNDERCOUNTER PRE-WIRES UNDER KITCHEN CABINETS, & A WINDOW BLIND PACKAGE. COMMUNITY HAS A BEAUTIFUL CLUBHOUSE WITH A FITNESS CENTER, COMMUNITY POOL, PLAYGROUND, SPORTS FIELD, BASKETBALL COURT, AND TENNIS COURTS! PRICED TO SELL. EASY TO SHOW.